There’s no greater let down than mushy hashy browns. Restaurants have a knack for serving pale yet greasy hash browns. Not my jam. I like my hash browns crispy, golden browned, and not greasy. There’s no easier way to achieve hash brown perfection than this easy kitchen hack. 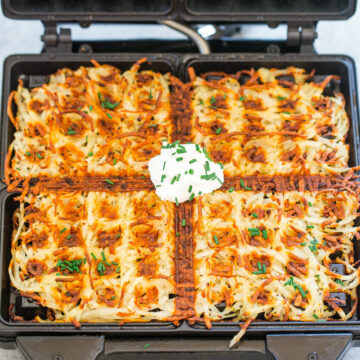 Dust off your waffle iron and enjoy hash browns that are the perfect balance of crispy yet tender. I use refrigerated hash browns and I don’t even have to bother wringing them out. I’m sure you can make this recipe by grating your own russet potatoes but I’d rather not use a roll of paper towels to wring out all the moisture. Same goes for frozen hash browns because as they thaw they’ll release tons of water. Water is the enemy of crispy hash browns and I find the refrigerated hash browns to have the least water and therefore are the least work. As a healthy benefit there’s no oil, very little butter, and no eggs. They are not greasy at all and are very light-tasting. I seasoned my hash browns with dried onion for extra flavor and served them with sour cream and chives. Because all waffle irons, potatoes, and preferences for doneness vary, cook until yours are done to your liking. For me that was nearly 20 minutes in my waffle maker but start peeking at about 10 minutes in case yours is a sizzler. 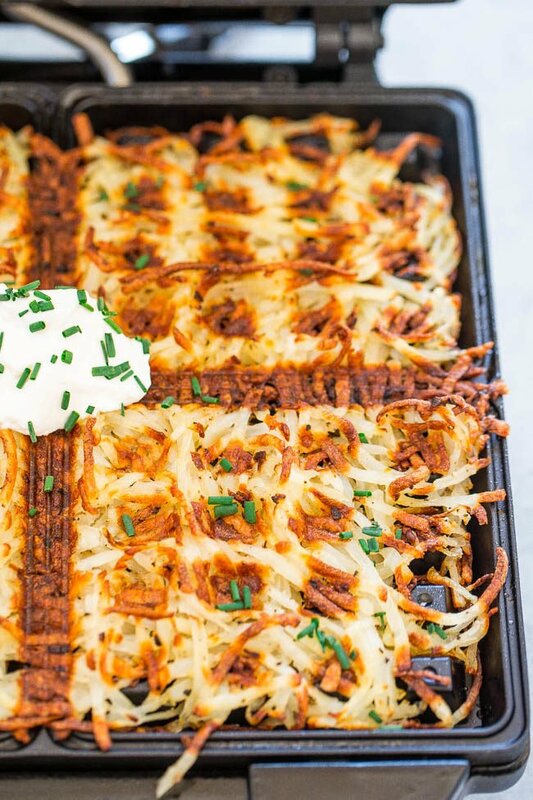 There’s no easier way to achieve hash brown perfection than this easy kitchen hack. 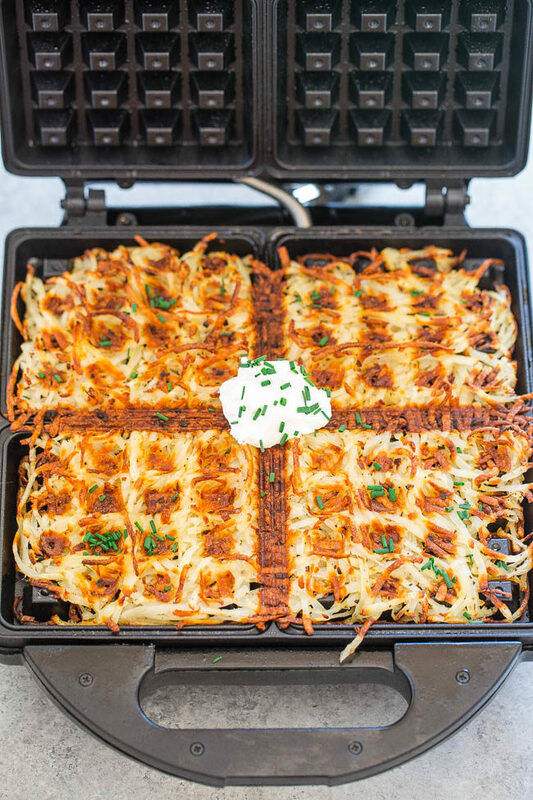 Dust off your waffle iron and enjoy hash browns that are the perfect balance of crispy yet tender. I use refrigerated hash browns and I don’t even have to bother wringing them out. As a healthy benefit there’s no oil, very little butter, and no eggs. They are not greasy at all and are very light-tasting. Because all waffle irons, potatoes, and preferences for doneness vary, cook until yours are done to your liking. Preheat waffle iron to medium-high; set aside. To a large bowl, add the potatoes, onion, salt, pepper, and toss with a fork to combine. Evenly brush the grates of the waffle iron with melted butter. Add the potatoes to iron, evenly mounded in the center, and lightly press iron to close it, noting that it may not close completely right away. Cook for 2 minutes. Close iron completely and cook for about 12 to 20 minutes, or until crisp and golden brown. Peek at about 10 minutes to see how it looks. Cooking time will vary based on how hot your waffle iron gets, how much moisture is in the potatoes used, personal preferences for crispiness, etc. Tip – midway through cooking if you want to accelerate the process, brush additional melted butter onto the top grates of the iron or directly on the potatoes. Optionally add sour cream and chives before serving. Hash browns are best warm and fresh. 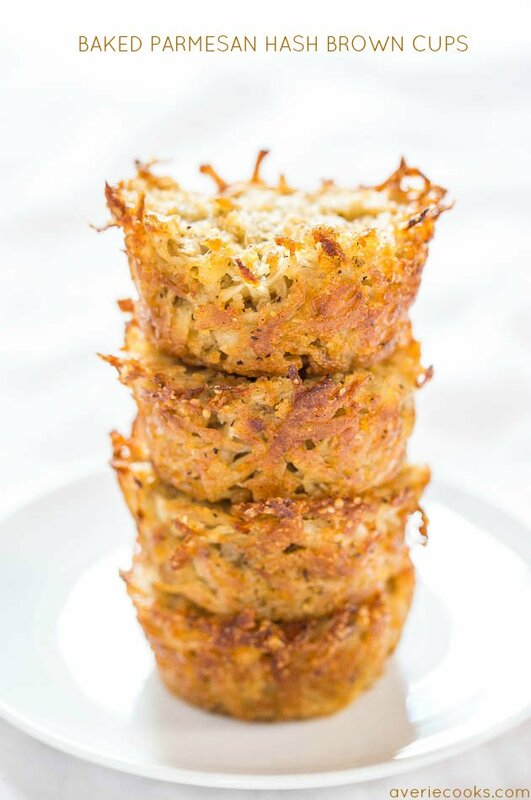 Baked Parmesan Hash Brown Cups – Easiest hash browns ever! No stovetop flipping! 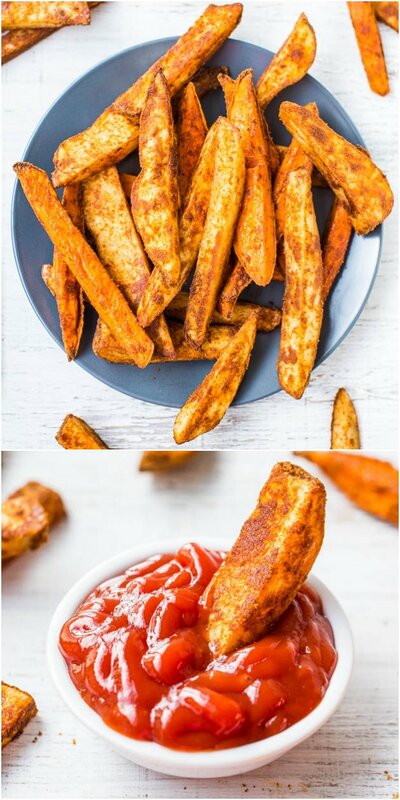 A great side dish, fun party food, or game day snack!! 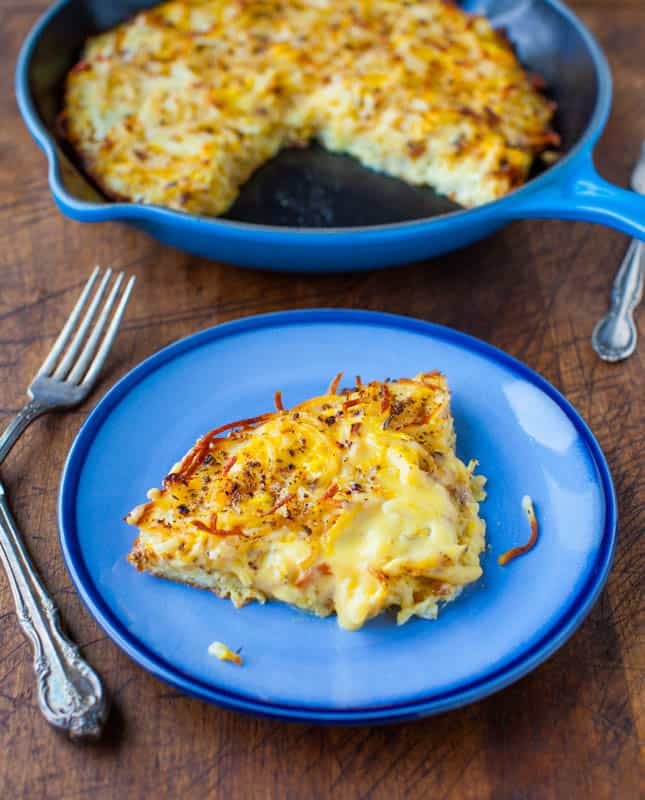 Creamy and Crispy Hash Browns Frittata (vegetarian, gluten-free) – Soft, creamy eggs with crispy, crunchy hash browns are a perfect match! Easy comfort-food recipe that’s great for breakfast, brunch, or brinner! 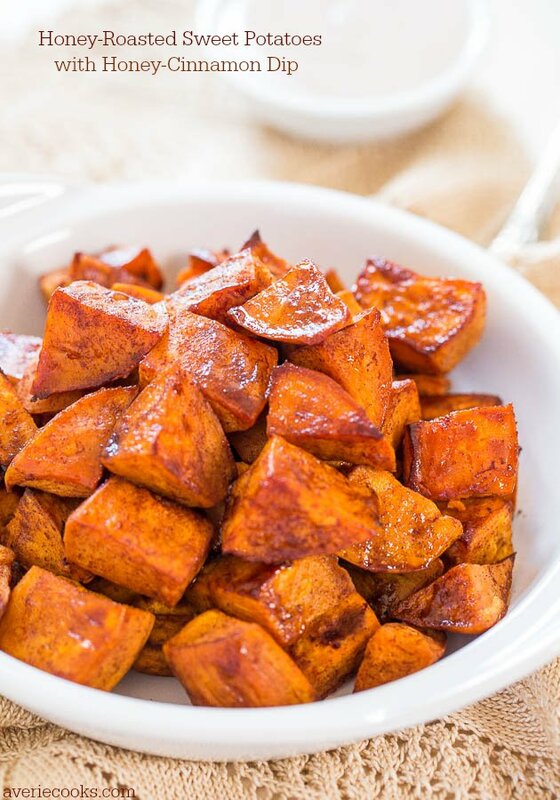 Honey Butter Smashed Sweet Potatoes – Soft, tender potatoes with crispy skin and the most heavenly melted honey butter on top! 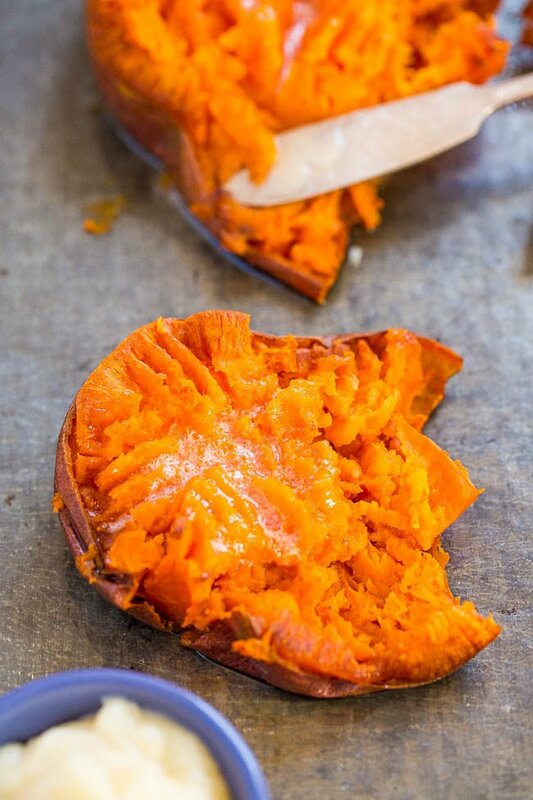 Easy comfort food that’s a perfect side dish anytime! 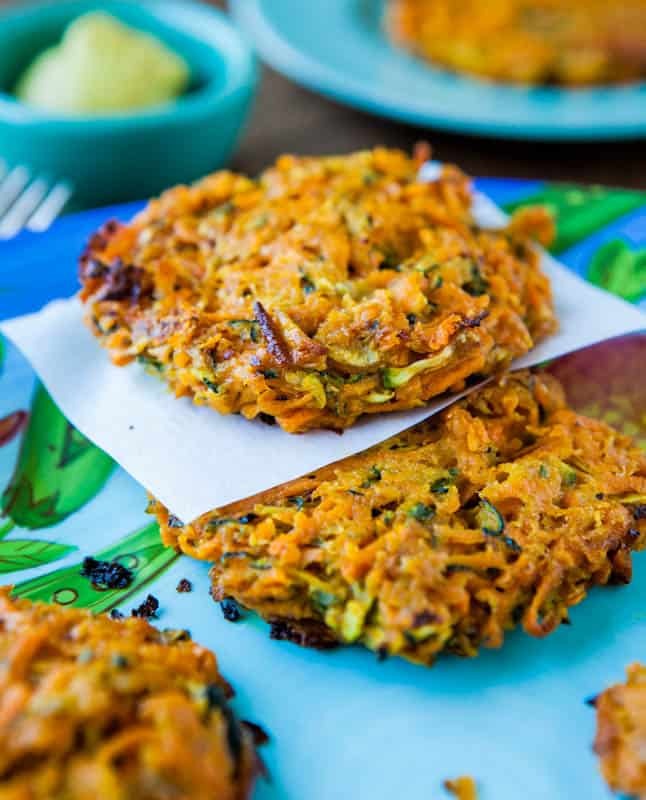 Baked Chipotle Sweet Potato and Zucchini Fritters – Healthy fritters that are baked rather than being fried in gobs of oil! These look perfectly browned and crispy. What a great way to use a waffle iron! I need to look around for refrigerated shredded potatoes. I’ve made frozen hash browns in a skillet before—way too much spatter for me. Yes – the spatter everywhere is no bueno! This totally eliminates that and you’ll love the results! A tip for getting rid of excess water from veggies – put them inside a potato ricer. I’ve done this with zucchini but it should work with potatoes too! I don’t have a potato ricer and it’s probably not a super common item that people own, but if you have one, I bet it works great! Yes to crispy browned potatoes! Thanks for linking up and sharing the links only rather than the full recipe. Appreciate it! Have you ever tried this with the dried hash browns (of course after being hydrated)? Seems like you could control the moisture on those. Only have made the way I wrote about. These are right up my husbands alley. Did you use a Belgian Waffle Maker? Thanks for the great recipe. I found a recipe for these hash browns using tater tots and I tried them the other day. They were DELICIOUS! Ithink these would be easier and will give them a try , I know they will be just as good. Thanks. Interesting! I may need to try it with tater tots, too! This is probably the most genius thing I’ve ever seen! Well thank you! Seriously the best hash browns I have ever eaten! Goofproof and no grease splatter! The recipe for the waffle iron has browns is in this post and if you want the recipes for the other items you click on the links. This is my fave way to make hash browns! Glad you’re onto this trick too!